In Isaiah’s beautiful rhetoric quoted above, he likens the loving, caring soul to be like a watered garden. What do watered gardens do? They bring forth and nourish new life. Because they contain the ingredients for new, healthy life, they have the power to bring it forth. We, as Christians, who are committed to growing more and more like Christ, and who hare His spirit within us, also have tremendous power to bring forth new, enhanced life in those we affect. One incredibly effective way in which we can bring new life to others is through affirmation. To affirm means to state or assert that something is true or valid. Anything we do or say to someone else that indicates that the person has value, or real worth, is affirming. The ultimate affirmation was when Jesus died on the cross for our sake. He certainly showed us we have great value. Affirmation makes a lot more difference than we commonly think. Being told, “Hey, you did a great job,” can shift a person’s mental and emotional state to the positive for the whole day. When a person’s mental and emotional state goes more to the positive, so does his physical state. In other words, because our mental, emotional, and physical systems are all interconnected, frequent affirmations can actually help someone become healthier. Affirmations affect deeper than on a conscious level. They affect on a gut level. They can actually enable and empower others to have the strength and motivation to do things better and to be better people all around. Affirmations can change attitudes to the good side. They can greatly improve relationships. For example, if all the members of a dysfunctional, problematic family were to somehow decide to verbally, and in other ways, affirm everyone’s good behaviors, the family would improve dramatically. Everyone would do better and be happier. I am reminded of a conversation I had with a high school basketball coach years ago while on a long train ride. He said that his training policy was not to emphasize what the players were doing wrong, but to emphasize what they were doing right. They won the tournament! Then, too, I recall, while teaching a class in psychology, I had given the students the assignment to sincerely compliment three people during the week, and to then report back as to the people’s responses. Well, I was very gratified to hear that the recipients of the compliments were very pleased, appreciative, and brightened up. One student stated that the man he complimented even offered to wash his car! Let’s Make Affirmation a Habit! In considering the converse, we can’t abandon constructive criticism, or correction. We all have limits set on our behaviors, from God, from our society, and from the others around us. Infringement of those limits generally carries negative consequences, mild or severe. We can’t condone sin, inappropriateness, or outright carelessness. But, in our dealings with others, when we need to correct or disagree, we can still do so in as unhurtful, tactful manner as possible. Receiving too many negative responses from others is very destructive to anyone. The individual feels “put down,” devalued, and disempowered. The person usually feels bad about him or herself, and likes the critic a lot less, especially if the criticism seems unfair or too harsh. Trust in the relationship is damaged. Emotional, mental, and physical health suffer, sometimes very badly and very long term. Usually, depending on the severity and frequency, the criticized person will not, and cannot, do as well. Feelings of happiness and joy take a nose dive. Similarly, not inviting a relative or close friend to social events, not calling, not helping, not being reasonably attentive has negative, not merely neutral effects, especially if repeated or long-term. Children brought up with criticism overload usually become very discouraged angry and act out negatively. The jails and prisons are full of such people. Or, children can become withdrawn and inhibited. Neither negative state is conducive to doing well in school. In referring to Christians who discourage other Christians, Jesus was adamant against this. “But if any one of you causes one of these little ones who trusts in me to lose his faith, it would be better for you to have a rock tied to your neck and be thrown into the sea” (Matt. 18:6). We should have a lot of sermons on that one! Where Do The Animals Fit In? 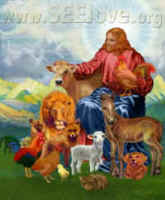 Animals, referring to those in our care in some way, benefit greatly from affirmation similar to humans. Attention paid to them, “good boy, good girl,” treats, being taught skills, being taken places with us, being given a comfortable environment, and the like all show them they are loved and valued in a real way. I know my dog gets excited and feels important when it is time to walk to the mailbox, or to go “bye” in the truck. Expert horse trainers maintain one should always end a training session with a maneuver the horse does well, which leaves the horse feeling good, because he can be successful and because we are pleased with him, Absence of affirmation, and repeated criticism and punishment, cause animals to become miserable and to languish or develop behavior problems. Same rules apply as for humans! Isaiah was right, profound thinker and deeply spiritual man that he was. Loving, caring people do bring life to others, humans and animals. I’m convinced that love and affirmation go together. It’s hard to believe that one can be loving without being affirming. Also, leaving out deserved affirmations, and overloading with harsh criticisms, is certainly not loving. The importance of this topic cannot be overstated. Noticing “the good” in others demonstrates good manners, graciousness, caring, and sensitivity to the feelings of others, human and animal. Such gestures also help to heal hurts others have previously experienced from people not so sensitive. Expressing affirmations also models such positive social behavior for others. My goodness, no matter how you look at it, expressing affirmations seems to be a good way to go, and a way which Jesus would applaud!